Create a new folder button. Mouse Selection Tool - allows you to select view elements using the mouse-over area. Suggested elements - suggests elements based on application structure. Search by Property - allows you to lookup view elements by a combination of properties. Mouse-over area for Mouse Selection Tool. View Structure Tool - displays the current view tree, very similar to the Chrome's DOM inspector. Platform Availability - the list of platforms for which the element snapshot has been recorded. Identifying Properties - specify how to look up the element in the view. 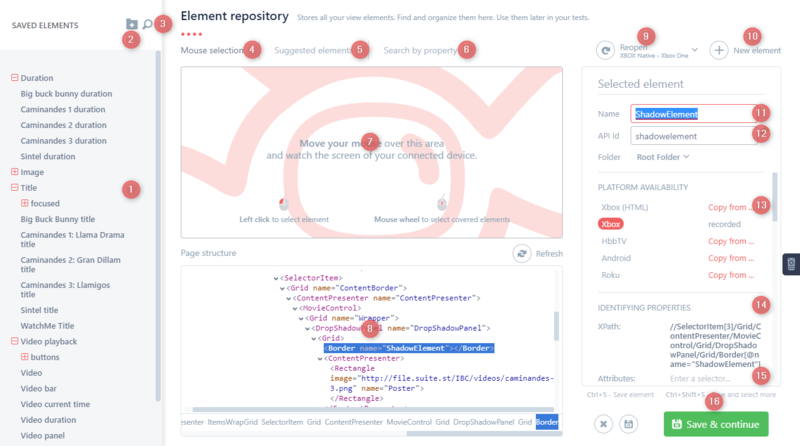 State snapshot - a snapshot of element properties at the time it was added to the repository. Save or update element button.